With summer coming to an end and vacations over it’s time to find things close to home to keep the kids (or grandkids) occupied. 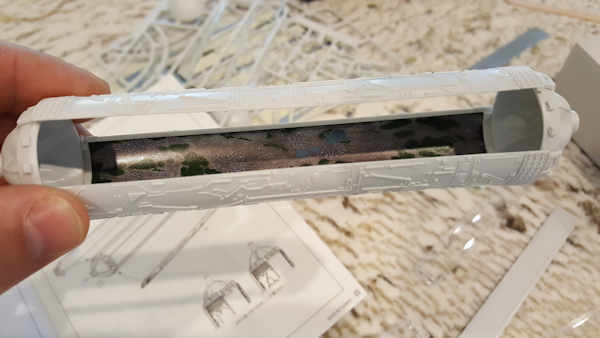 How about an O’Neill Colony that’s easy to put together and makes The Vision a physical reality that you can see from all angles … on a desktop scale? Long ago SSI paid thousands of dollars and waited months for a rather large Bernal Sphere model to take to conferences, alas that model was lost to the past (and as I hear tell, it was a pain to move from place to place) but right now for just about the cost of a video game your family can have an O’Neill Cylinder that you can put on any shelf or take with you to meetings. This model from the Wave company in Japan was created for fans of the Anime series Mobile Suit Gundam 00 (which has no relation to the annoying song, “MSG” is a multi-season series set in a future where SSI Colonies and Solar Power Satellites – and giant mechs – are part of normal life). This is a near-perfect Island for engineers and budding engineers to display. Plus, it’s really easy to put together. Technically, it just snaps together so careful fingers and a fingernail file to gently smooth the little nubs down is all you need. 1) The box. See, it’s an O’Neill. 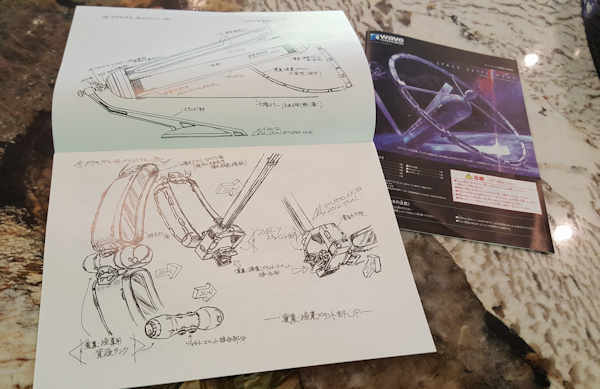 2) The cool special booklet showing details of the “real thing” It’s in Japanese, but pretty obvious. 3) After carefuly removing the parts from the marked pieces frames (they are all numbered to make it easy), you just apply the stickers that show the interior valleys and snap them to the end caps. 3 take 2) Oops, the instructions say to snap the three windows in first, that helps the valley parts sit better between the windows. 5) Slide the end cap covers over the end caps and the mirrors lock into place, meaning no glue is required and all of a sudden the model is very secure. Now just slide in the metal bar, slip that into the base, then pop on the agriculture ring and the service module and… voila! 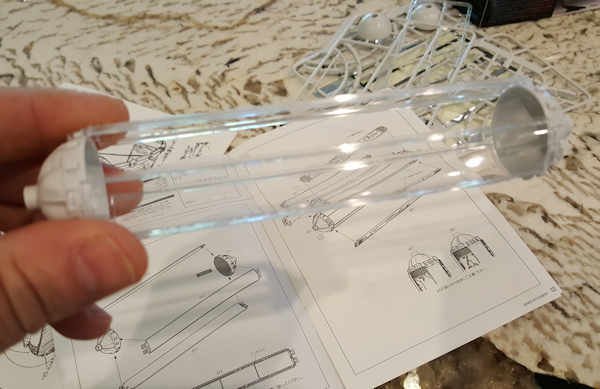 Now, when I was trying to get the ag-ring pieces separated from the pieces frame I accidentally broke part of the ring (you might notice it sagging a bit at the top near the support strut). So I drove over to the local Michael’s Crafts store to get a tube of model glue to fix it. While I was at the model section of the store there was a young man about 13 or 14 going through the paints and he asked me what I was working on. I told him it was a space colony which made him give me a quizzical look… so I said “the Space Colony from Mobile Suit Gundham” and he said “Ooh, nice!” I think that’s an interesting piece of information for folks who may be looking for a common-ground way of starting a discussion of The High Frontier concepts with younger generations. I think I left too much of the paint on the brush … but still, it seemed to be a great tip! The Wave Space Settlements O’Neill Colony model is available from sellers on eBay and Amazon. I’ve found the Amazon sellers tend to have a much better price, I paid all of 35 dollars including shipping from Japan and I see them going for 60 on eBay. Here’s a link to one of the Amazon listings (there are a few, actually) the seller I bought from was Toy Shop Japan Hobbyone, and I bought a second one for a gift from seller Makimono – both of them came in about a week, no problems at all. By the way, if you came to this post after googling for Sports Illustrated Supermodels, I do apologize ;-). 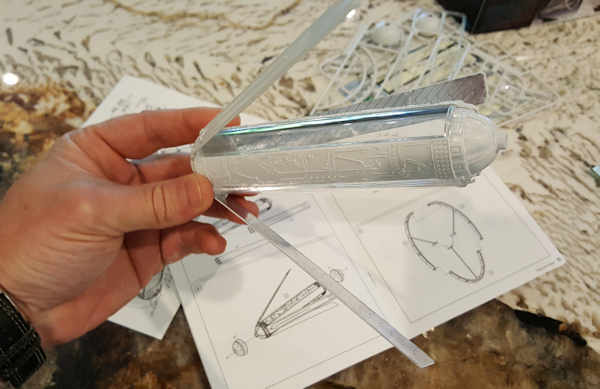 And if you’re wondering why this post is titled “part 1″… come back in a day or so to get the instructions for a make-it-yourself working SSI Mass Driver. Yes, I’m serious. 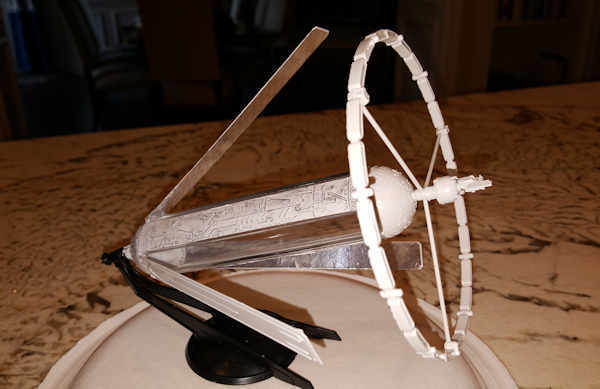 This is one that might spur your kids to consider a really cool Science Fair project this year! Previous PostHigh Frontier giveaway results are inNext PostEnergy. And Power. Dude – this is a sweet piece. We need to figure out a way to send alerts to the membership and to the SSI Facebook page whenever you post. Thx Anne. It’s a very nice looking model. Quite true to the O’Neill design – and (thankfully) very easy to make. SSI was facebooking a while back and we will be resurrecting it. Mixing the social and the art: Do you remember when Robin Snelson was doing all of the SSI Second Life work? Geeze, she had a huge posse making some amazing code and models. I wonder if an SSI Associate would be willing to pick that up. 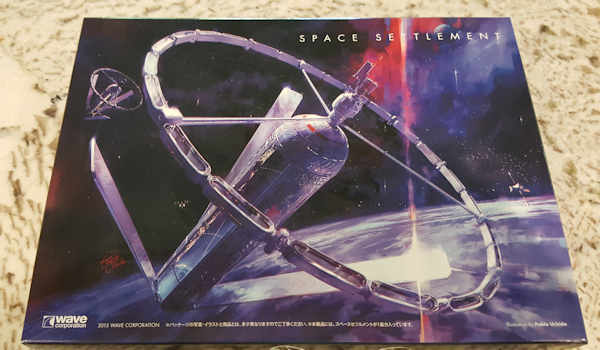 There are hundreds of great SSI designs out there from Artists (Ben Margolis did the SSI Bernal Sphere art for the SSI Overview video) and being able to fly through them would be a lot of fun and great for the visualizations that help some folks make the jump into the possibilities in this life. 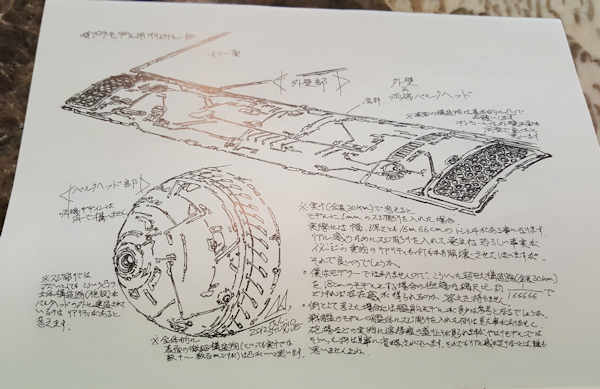 I got a similar space colony model from Japan on eBay and it was one and a half inches long and two inches wide–not exactly a showpiece for students. What are the dimensions of the one shown above? Yeah, we have a few of those around the office too, not bad for the size but not a great size, I stuck one on my dashboard. This one is 8 inches long, the ag-ring is 5 inches in diameter. Good desk-sitting size. And with the windows being clear so you can see the valleys it’s captivating for some kids, my kid keeps picking it up and peering in for a good view (the wheels of imagination turn – I hope). 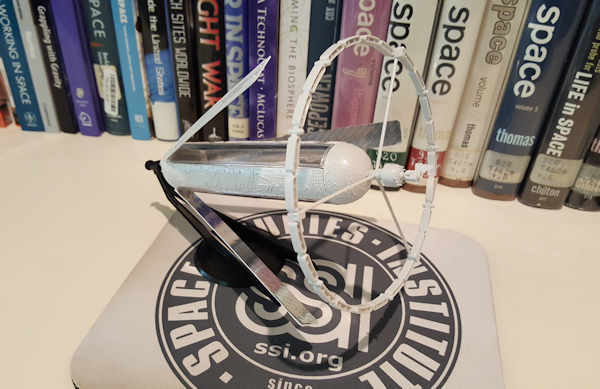 Speaking of models for conferences, I recall that we (Chicago Society for Space Studies) got the SSI lunar telerobotics “simulator” for the 1989 ISDC that was held here in Chicago. It was a wonderful way of demonstrating the challenges of remotely driving a rover across the surface of the Moon from the comforts of Earth. Yes, yes, that’s right. The hacked RadioShack Armatron! An amazingly effective tool for proving Lunar remote control. How the heck did they re-code that thing to force the delay into the commands back in the day – it was analog. Y’know, Armatrons are on ebay for nearly nothing if someone wants to re-make that great simulator demonstration in all of it’s retro glory. To do it complete you’d probably need a hardware delay box for the camera – the big huge CCTV camera. Of course it could be created by current Makers using a Raspberry Pi , a servo kit, a web cam and some script-kiddie Java or a python wrapper. Hmmmmm. Jim, there’s another long, bitter winter coming to Chicagoland, a project like this might be just right for keeping your group’s mind off of the cold :-). Send pictures and video, we’ll post them or link to them!